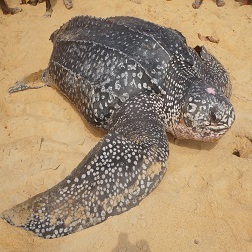 The Leatherbacks (Dermochelys coriacea) are the largest of the sea turtle species. They can grow to be 130 to 183cm (4 to 6 feet long). They can swim everywhere and are the only turtle species known to be active in water below 40 degree Fahrenheit. They are called the champion of all sea turtles. The Leatherbacks have no scutes (scales) on their head nor do they have scales on their carapace like other sea turtles. The carapace of the leatherback is soft and leathery with seven ridges running front to back. They are bluish black all over except for their plastron (bottom shell), which is white. They feed almost exclusively on soft-bellied animals and their favorite food is jellyfish. They have a deeply notched upper jaw and can weigh up to 2,000 pounds. The Leatherbacks can be found in open oceans. They nest 4 to 7 times in a season and their eggs will usually develop in about 65 days.